62 percent of those incidents involve breaches of small and medium-sized businesses. Today, Cyber threats are more organized and sophisticated than at any time in history. Get the complete picture for your business with a custom Cyber Security Assessment provided by Upvant™. The Assessment is done by a certified Cyber Security IT Professional using industry accepted cyber security practices. We transform the raw assessment data into live, visual and informative dashboards that are easy to read and support better business decisions. View your completed assessment with easy to follow executive reports. Gain a measurable process of your businesses risks and Cyber Security preparedness. 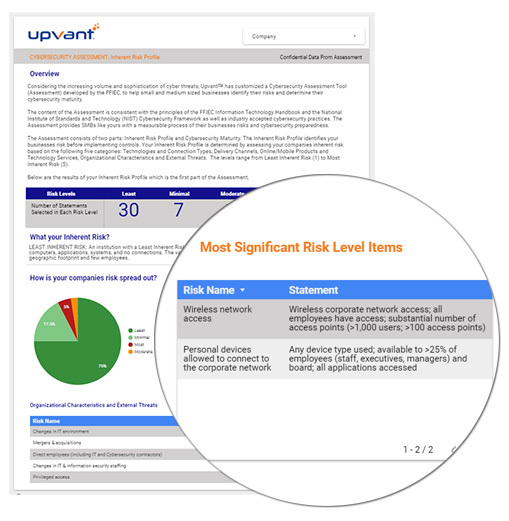 View your risk level for each activity, service and product. Analyze mitigation plans and recommendations. Interpret and analyze assessment results. Filter reports by risk level, category, assessment date and more. * – Simon, Ruth. “‘Ransomware’ a Growing Threat to Small Businesses.” The Wall Street Journal. April 15, 2015.